Senai Kizhangu or Elephant yam is a high in fiber vegetable. 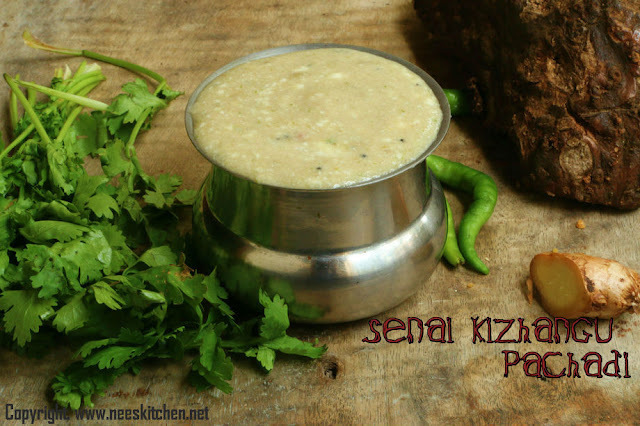 There are various ways to prepare this dish one of my favorite is the senai pachidi or elephant yam raita. I rarely prepare this dish in Singapore as we do not get this in our neighborhood shops and I need to go to Little India for this. This was one of the recipes in my wish list for my mom to cook for me. Generally elephant yam is fried as a curry or chips. This is completely the boiled version of using the elephant yam and it is very healthy. This recipe can be served as a dip for Italian or any other western dishes without garnishing. 1. Add water to cover the yam and steam them in pressure cooker for 3 whistles. 2. Add coriander leaves, chili, ginger into a mixer. Grind and keep it separately. 3. Take out the yam from the cooker and allow it to cool. Grind it separately. 4. Mix yogurt, salt, coriander-ginger mix, yam into a bowl. 5. Temper with mustard & urad dhal. 1. You can blend coriander-ginger mix and yam together. 2. Do not add excess while steaming. 3. Do not add chili beyond the quantity mentioned. 4. Garnishing is optional step if you want to use this dish as a dip for Italian or any other western dishes. 5. You may add a pinch of cumin powder.